Every year, more than 38 million children and adolescents in the U.S. play organized sports, as estimated by the National Institute of Arthritis and Musculoskeletal and Skin Diseases (NIAMS). If you’re the parent of one of these children, you know the positive effects that these activities can have on a kid’s physical health and self-esteem. However, you may also worry about the possibility of injuries. Indeed, nationwide data, collected by the U.S. Consumer Product Safety Commission’s National Electronic Injury Surveillance System, shows that 1.35 million young athletes end up in the emergency room every year. Because children’s bodies are still growing, their skeletons are not yet mature. That means that their bones have a higher water content, lower mineral content and rich blood supply that makes them less brittle than an adult’s bones. The growth plates that connect their bones are made or cartilage that is weaker than bone and more prone to injury. What makes sports injuries so worrisome for children is the fact that their bodies are still developing, and any mishap can potentially cause long-term damage. The key to protecting your young athlete may lie in understanding what the most likely injuries are and how to prevent them. According to experts from the NIAMS and the Centers for Disease Control and Prevention (CDC), the five most common sports injuries among children are sprains and strains, repetitive motion injuries, growth plate injuries, heat-related injuries and concussions. Sprains and strainsWhile sprains affect the ligaments, strains impact the muscles or tendons directly. Repetitive motion injuriesThese conditions, which include stress fractures and tendinitis, may not show up on X-rays. Consistent elbow or shoulder pain could be a sign of a stress or overuse injury, so a consultation with a sports medicine specialist should be sought sooner rather than later. Growth plate injuriesThe growth plate is an area of bone tissue where growth and elongation occur as a child ages and develops. These are located at the hands and fingers, forearms, upper legs, lower legs and feet. Damage to the growth plates requires the attention of an orthopedic specialist. Heat-related injuriesBeing physically active in the sun and humidity may lead to dehydration, heat exhaustion or heat stroke. Symptoms of these complications include nausea, dizziness, headache and confusion. Heat stroke is potentially fatal. ConcussionsThe CDC estimated that, in 2009 alone, more than 248,000 individuals aged 19 years and younger went to the emergency room for sports-related concussions. If your child may have experienced a concussion, he or she should not take part in sports until they have been examined and cleared by a physician. Although concussions are considered a mild form of traumatic brain injury, long-term consequences can include deficits in memory and movement, as well as emotional and sensory functions. 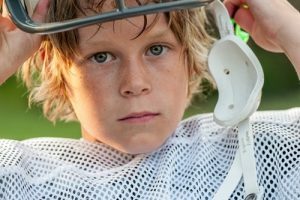 Researchers have found that 3 months after concussion, children age 8-16 had persistent deficits in processing complex visual stimuli, and compared with similar students without a history of concussion, young athletes with 2 or more concussions demonstrated statistically significant lower grade-point averages. In addition, several studies have found that it takes younger athletes up to 10 days longer to recover from a concussion than a college-aged or adult athlete. As with any other health issue, prevention is the best medicine for sports injuries. Pre-season conditioning programs can help reduce injury rates in young athletes. Enroll your child in organized activities with knowledgeable coaching staff and trainers. Make sure the proper gear and uniform are used correctly. Emphasize the importance of warm-up and cool-down exercises and make sure your children learn safety tips that are specific to the sport they play, as well as how to stay hydrated before, during and after practices and games. Avoid playing one sport all year and limit weekly and yearly playing time. Limit sports specific repetitive motions like pitch counts. Make sure your child’s practice includes scheduled rest times. Lower the risk of burnout by emphasizing skill development over competition and winning. Any serious injury should be assessed by a physician. Once your child starts recovering or needs to learn more about injury prevention, consulting a sports injury specialist is a good way to ensure that he or she can stay healthy, grow strong and have fun.